Taylor Made Photography are a specialist wedding photographer in Bournemouth & Poole. 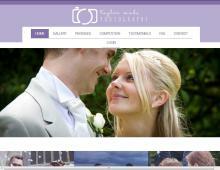 They offer a wide range of wedding photography packages in Dorset & Hampshire. You can choose from wedding photography packages with 1 or 2 wedding photographers; 5 or 6 hours or all day coverage and whether you want just digital or a mix of digital and printed photos. Taylor Made Photography has earned a great reputation for providing top quality Hampshire & Dorset wedding photography services. From modern wedding photography in Salisbury and traditional wedding photography in Southampton to natural wedding photography in the New Forest and reportage wedding photography in Hampshire, Taylor Made photography will create magical memories on your special day. They are well known for creating really beautiful wedding photography in Poole and Bournemouth at fantastic wedding venues in the area such as Compton Acres, The Harbour Heights Hotel and Bournemouth Beach. As a creative wedding photographer in Dorset they also attend weddings in remoter locations in Dorset, Hampshire, Wiltshire & Somerset. If you are looking for a professional wedding photographer in Winchester, Southampton, the New Forest, Bournemouth, Poole or Dorset contact Taylor Made Photography for a free quotation.